DICE talks about changes to jets, tanks, and most importantly, boats, in an extensive guide to Battlefield 4's vehicles. Jets. Tanks. Boats. Vehicular combat is probably the defining feature that sets the Battlefield series apart from that other modern military shooter. 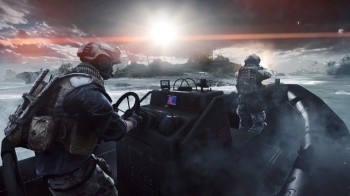 It will obviously play a big part in Battlefield 4, and DICE have today published a massive guide on the land, sea, and air vehicles you'll see in the new game, addressing multiple concerns players had with vehicles in Battlefield 3. First up is boats. Battlefield 3 veterans will know that boats were more of a footnote than a fully-explored vehicle option in the previous game. But, DICE aims to fully flesh them out in Battlefield 4, adding multiple classes of boats from speedy patrols to powerful "tanks on water" assault boats. The biggest challenge faced by the team was getting other players in the boats with you. They fixed this by making boats serve as a team spawn point (like the transport chopper) and adding more fixed guns for gunners to play with. As for tanks, you can look forward to having more anti-air options as secondary weapon unlocks, to help keep those pesky jets and choppers away. Furthermore, vehicles won't be permanently "disabled" like they were in Battlefield 3. Scoring a "critical hit" on a tank (IE: hitting it in the weak spot in the back) will temporarily disable it instead, meaning skilled drivers and gunners won't have to abandon their vehicle. Lastly, jets have been split into two separate classes: Stealth Jets, which focus on air-to-air combat, and Attack Jets, which will have a set of unlocks that are all about bombing stuff on the ground.